The 52 Ft Obstacle Course is great for School Field Days, Church Fundraisers and Home Parties. Great for events were there is a mix of younger children to adults. A challenge Course for 5 to Adults. This 52 foot Obstacle Course rental is an excellent obstacle course for your next event. It is very popular and affordable obstacle course rental since it is great from ages 5 -up. It also provides a perfect balance of obstacles for climbing and sliding. The 52 foot Obstacle Course is great if you are looking into renting this for a corporate event. We also support birthday party, anniversary, family picnic and school festivals. So, we suggest booking early! This obstacle course rental is hard to get during the very busy fall and spring event! Most parks do not make available power connections so a generator rental will likely be required if at a park site. This obstacle course requires 2 (20) amp circuits or a generator that has at least 6500 kw of power. This obstacle course has it all. Participants start at the Tunnel Crawl, and get into the Log Jam. Crawl over a hurdle, then run through 5 foot tackle dummies. They then go through the mouse hole. Finally they reach the 14 foot climb and slide to scream down to the finish. 52 feet of absolute fun! Our 52 foot Mega Obstacle Course rental is a great interactive game for ages 5 and up. When the competition is over, they can use just the slide for non-stop excitement. Our 52 foot Mega Obstacle Course rental measures 52’Lx11’Wx14’H. We do ask that the customer provide an area that is at least 56Lx15Wx15H in order to ensure the obstacle course fits appropriately. Also, we do ask that the customer provide full supervision for the duration of the event. If you are looking into booking this for a public event do let one of our party rental specialist know and they will talk to you about our fully staffing capabilities. This 52 foot Mega Obstacle requires (2) 20 amp electrical outlets within 100ft. 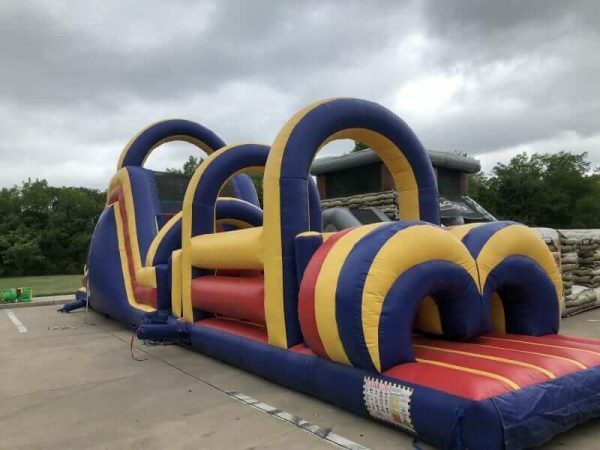 For our obstacle courses, waterslides and larger items, Starwalk of Dallas delivers in most areas of Dallas and Tarrant county and will go to surrounding areas for our larger inflatable rentals or larger events. Star Walk of Dallas has been serving the DFW metroplex since 1998. We also have a wide array of family entertainment such as inflatable slides, obstacle courses, wipeout, rock wall and dunk tanks. We also have the cash cube / money machine, zip line rental, wrecking ball, carnival entertainment, cotton candy machines, popcorn machines, margarita machine rental. Call us today at 214-340-6666 to rent. Most parks do not make available power connections so a generator rental will likely be required. This obstacle course requires 2 (20) amp circuits or a generator that has at least 6500 kw of power. This kids obstacle course has it all. Participants start at the Tunnel Crawl. They then get into the Log Jam, crawl over a hurdle and run through 5 foot tackle dummies. Finally, they go through the mouse hole to reach the 14 foot climb and slide. Then they slide down to the finish. 52 feet of absolute fun! Our 52 foot kids Obstacle Course rental is a great interactive game for ages 5 and up. When the competition is over, they can use just the slide for non-stop excitement. Our 52 foot Kids Obstacle Course rental measures 52’Lx11’Wx16’H. But we do ask that the customer provide an area that is at least 56L x 15W x 18H in order to ensure the obstacle course fits appropriately. We also do ask that the customer provide full supervision for the duration of the event. If you are looking into booking this for a public event, we can help to staff. Just ask one of our party planners ask about our fully staffed option. This 52 foot Mega Obstacle requires (2) 20amp electrical outlets within 100ft. Similar item – The Mega 65 can also be made into a 45 foot obstacle course that would be similar to the 52′ kids obstacle course.